Natty sound menu adds playlist support - OMG! Ubuntu! 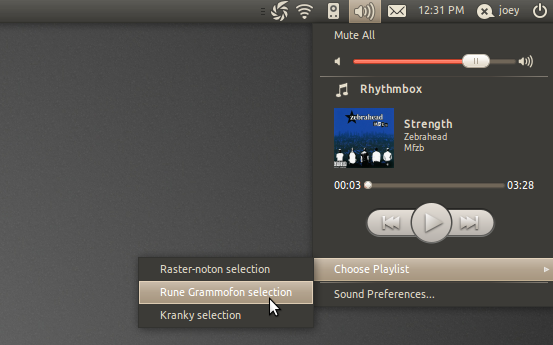 The Sound Menu of Ubuntu 11.04 Alpha sees the return of play list support – an easy way to access your favourite track line-ups in Banshee without needing to open the app itself. Elephants, or readers with good memories, may recall that this very feature was proposed for inclusion in Ubuntu 10.10 – and did begin to see implementation. Sadly various issues and rethinking put paid to both it and the track scrubber (remember that?). The final release of Ubuntu 10.10 saw neither included. Whether or not a similar fate is beholden to the Natty version remains to be seen, but for now at least Alpha testers can play around with initial playlist support in their Sound Menu.